Recently I heard about the book Lemon Tart- a culinary mystery. I couldn't get over the "culinary mystery" part so I decided to check it out. This book centers around a homemaker who loves to bake and includes the recipes along the way. 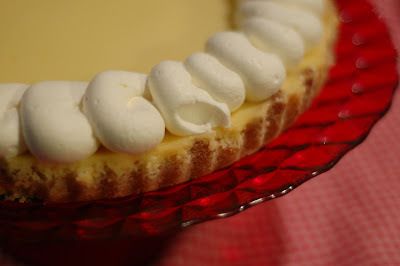 I loved reading it and couldn't wait to try a recipe- so of course, I made the lemon tart. It was simple enough that I could make it with Little Man's help and Baby Strawberry in my arms. That's the kind of recipe I prefer these days. So really, anyone can make it. You could even sub out a graham crust if you don't want to bother with the pastry. C&H also sent me some money to buy some of their sugar (which I did, in bulk, at Costco. I'm not the only one that buys the 30 pound bag and fills a huge bucket in the pantry, right? Right? Well, I know my mom does too, so I don't feel too bad). I used the granulated sugar in the tart and the powdered sugar in the crust and whipped cream. My husband loves to eat the C&H dark brown sugar right out of the bag. Don't let him know I told you that. They also have a huge selection of holiday recipes on their site. I'm going to feature one next week... as soon as I pick which one to try. I'm thinking maybe the egg-free sugar cookie dough for my beautiful (allergic to eggs) niece Carlee or the peanut butter topped toffee bars for my Tall Man. He's going to get hungry after he finishes off that bag of brown sugar (fortunately I have several back ups, he's lucky to be married to a stockpiler!) Either way, check back next week. It's going to be delicious. You can read the first chapter here and see the recipes she has included. There is also a nice interview here about the book and how she came up with the ideas. I also contacted the author and she agreed to giveaway a copy of the book to one of my readers. Leave a comment letting me know the best book you've read lately. 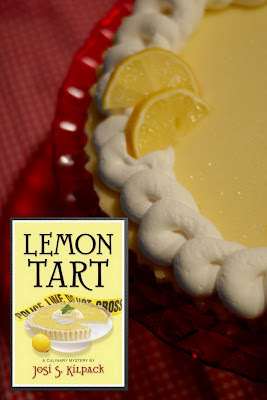 And don't forget to check out Lemon Tart and the next in the series, English Trifle for a fun and refreshing read. You can find out more about Josi Kilpack at her blog or site. Thanks Josi for the fun giveaway! Preheat oven to 425 degrees. In a food processor or mixer, combine ingredients for crust. Pulse together until a dough starts to form in clumps (then I pulsed in the egg). Press into tart pan, making sure to cover bottom and sides evenly. Pierve the bottom of the crust with a fork and place in freezer for 10 to 15 minutes. Place tart on a cookie sheet and bake until crust is a golden-brown color, approximately 12 minutes. Remove from oven and let cool. Reduce oven temperature to 350. Mix cream cheese with electric beaters until smooth. Add sugar. Mix until well blended. Add the eggs one at a time, mixing thoroughly after each egg. Stop and scrape bowl halfway through. Add the lemon juice and zest and mix until smooth. Pour the filling into the tart crust and bake on cookie sheet for 20 to 30 minutes or until filling is set. Let tart cool on wire cooling rack. Cover and refrigerate until well chilled. Use whipped cream as an optional topping. It can be piped on in stars or served on top with each piece (I liked lots and lots of top of mine!). The giveaway will accept entries until next Thursday night, December 10, at midnight AZ time. U.S. addresses only and one entry per person please. I'm reading Madness by Marya Hornbacher and it's so good. A little dark but really good. The tart looks delicious! And... the last book I read was "Understanding Love: Marriage, Still a Good Idea" by Miles Munroe. Now I don't feel so bad about eating brown sugar out of the bag...I just finished A Homemade Life: Stories and Recipes from My Kitchen Table, by Molly Wizenberg, and it was fantastic. You are DEFINITELY not the only one who fills a bucket with sugar for your pantry! Much easier, less messy and we use a LOT of sugar! The best books I have read recently are the Percy Jackson and the Olympians series by Rick Riordian. Lots of fun! This tart looks so tasty!! I will make it soon. I have a goal to finish the Book of Morrmon this year. I have read it several times but for some reason it is more meaningful this time. So many lessons to learn! I always want it to end different, like 'happily ever after'. But it's teachings can certainly help us in our quest for 'happily ever after'! I buy all my sugar at Costco. It's a great deal! I'm reading Robert Ludlum's The Bourne Identity and I can't put it down. another food mystery author? cant wait to check her out. you should definitely try joanne fluke because she is in the genre. but the best book i just finished was nicholas sparks the last song. heard that it was being made into a movie so definitely can't wait for that to come out. This book sounds intesting. The last book I read is My Sister's Keeper by Jodi Picoult. The tart looks delicious! I can't think right now beyond the book I just finished reading: "Sick Girl" by Amy Silverstein. It's about a woman who recieved a heart transplant over 20 years ago, and how it has affected her life. Good book! That looks so good, and the book sounds like my kind of read. The most recent book I've read was "A Modest Proposal" by Michelle Ashman Ball, nothing earth shattering, but kind of cute and a fun read. The best book I've read recently is The Four Agreements. The tart looks amazing. I would like to say I have read something fantastic lately, but since I am in grad school my reading revolves around textbooks...not so good. I did read The Pout, Pout Fish with my 5 year old daughter! She enjoyed it. I just bought 25 pounds of sugar at Costco today! I'd love the win the book - I always like a good story combined with recipes. Looks amazing--would love to read the book! I just got finished reading The Christmas Clock and it was a good book. Please enter me in your giveaway. best book i read recently was power of a praying wife - so helpful! Who has time to read after cleaning up after my children, grandchildren, and granddog, sewing for said children and grandchildren, and trying to spend quality time with unmentioned husband. The best books I read these days are called blogs...maybe I'll take a go at one of the many books recommended here! Right after Christmas and more cooking, cleaning and sewing. Yim! That tart looks good! I just finished The Red Bird Christmas by Fannie Flagg. Kind of an old one, but a good one to get you in the Christmas spirit. It has some fun recipes in it too. I am reading Pillars of the Earth -it's definitely an interesting read and good historical fiction! The best book I've read recently is The Guernsey Literary and Potato Peel Pie Society by Mary Ann Shaffer and Annie Barrows. I couldn't put it down! Such a fun and unique storyline. Along with Joanne Fluke (who someone else mentioned) another good culinary mystery writer is Diane Mott Davidson. I just finished (today) the latest in the Sookie Stackhouse series. I'm thinking I need this book to satisfy my new baking cravings! :) Your tart is beautiful! I love love love lemon tarts! Thanks for visiting...I always love when you stop by! Your blog is always full of yummy stuff! How is being a mom of two these days? You're awesome, thanks for the shout out! I love anything with Lemon, best book would have to be where the wild things are. Anne- I would totally be interested in you selling baked goods for Christmas. All of them look so yummy. I have just started Stephen King's newest book, "Under the Dome". One of my all time favs has to the "The Thornbirds". The best book I've read recently was Grave Secret by Charlaine harris. Right now I'm reading a book titled The Morgue the Merrier. I love mysteries and particularly culinary ones. This one sounds great. so glad to hear there is another foodie mystery writter out there. Read Fluke and Davidson and The Tea room mysteries. Just finished reading The Girl with No Shadow (a sequel to Chocolat) and it is quite good. Giveaways are so fun! Particularly when they involve books...I'm reading Mistborn by Brandon Sanderson. Probably the hundredth time I've read it but I love it! I just finished reading " The 19th Wife"...great read! I have never read a "culinary mystery before" sounds like fun! this sounds fantastic! i would love to win!!! the last book i read was an anne tyler book but i forget the title. it had to do with dolphins and plane crashes and mystery affairs! That tart looks so delicious. The last book I read was Knit the Season. I love all those knit books.